Chonnam National University (CNU) introduced an ambitious program to improve its students’ English abilities in the first semester of this year. It is the 'English Proficiency Test to Freshmen (EPTF)'. However, the program has made students confused by failing to provide proper information on the test. In this article, the Chonnam Tribune reports on the EPTF, describing the purposes, progress and conditions that caused confusion among students. The EPTF was planned to arouse the importance of English to help students to achieve the average English ability standard by carrying out four examinations over two years. Students who get over 600 points on the first test do not have to retake the test, while students who scored under 600 points have to retake the exams until they get a score of 600. Students may take the exam up to four times over a two year period. 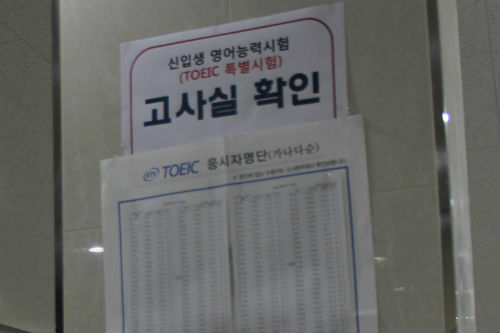 The type of test is from the Educational Testing Service and the level of difficulty is similar to that of regular TOEIC. The total budget for the EPTF program is about 200 million won and it costs about 10,000 won per person for a test. On the first EPTF, over 98 percent of freshmen took an examination and it cost about 50 million won. Since last February, CNU administration announced all freshmen must take the EPTF. About 98 percent of freshmen took the first test in a computer-based test (CBT) for two hours from March 18th to 22nd. Kim Jong-yoon (Freshman, School of Business Administration) said, “It was all done because of an unilateral force from somewhere. At least, the authorities should let us know what this program is and how it will be helpful to us. Half of the examinees from my room were absent.” About three weeks later, students who took the test could access their scores on the Internet. It was similar to the result sheet of regular TOEIC that has each category of reading comprehension and listening comprehension. It seems that the authorities’ failing to provide proper information on the test caused confusion among students. Some colleges and departments informed their students of the details of the test including its purpose, but others offered simple instructions and information for test-taking on a bulletin board on their website. Another method to deliver the test announcement to students was sending text messages with deficient information. But here, the further information might not be presented because of information delivery system problems. The departments in charge of the EPTF passed it to each college administration and each college to each department and division. There could have been omissions of information. From 2014, this program will change into the credit system so that students will be responsible for getting better scores. So freshmen, next year, should take four tests for a year, and submit the best score among them and it will turn into their grades of that subject called ‘Global Communication English’. This year, students' confusion was all because of the absence of communication between students who are the object of this program and the related administrations. If students know the objectives and progress of the EPTF, they must think it is a really useful and helpful program to enhance freshmen English capacity. The university authorities should have listened to what students were confused about and provided the necessary information to them on time. The EPTF is a valuable program since the university supports students for learning English from their freshmen year. English is the basic communication method to be a global person, and it is recommended to lift their ability over the average. Thus, from next year, students should be concerned with this test and the administrations should advertise it widely with detailed information.